Do you need a behavior management system that goes a little deeper than just your average whole class behavior management? 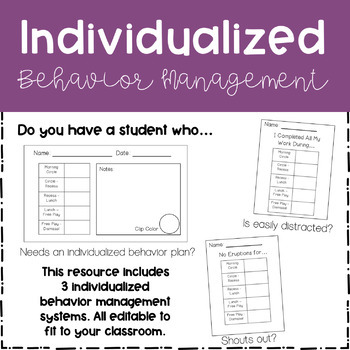 This resource includes three different behavior management systems that you can use with individual students. The first behavior management system is an overall behavior plan. This chart chunks your day into parts and after each part of the day, you call your student over and they either get a sticker for good behavior or they don't. The second behavior management system is for students who shout out. Again, your day is chunked into parts and after each part of the day, you discuss how the student's behavior was and they either get a sticker (for not shouting out) or don't. 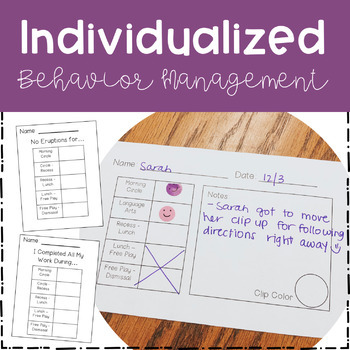 The last behavior management system is for students who get easily distracted. This sticker chart is chunked into parts and if they stay on task for a certain activity or amount of time, they get a sticker for that part of the day. This resource is editable so you can make it work for your classroom! Take pictures of you using this resource and tag me on Instagram!